The Delhi Metro (Hindi: दिल्ली मेट्रो) is a rapid public transport system serving Delhi and its closeby cities of Noida, Gurgaon, Faridabad and Ghaziabad. Its mass urban transportation for people of delhi in India. Delhi Metro system introduced comfortable, air conditioned and eco-friendly services for the first time in India and completely revolutionized the mass rail transportation in the National Capital Region. 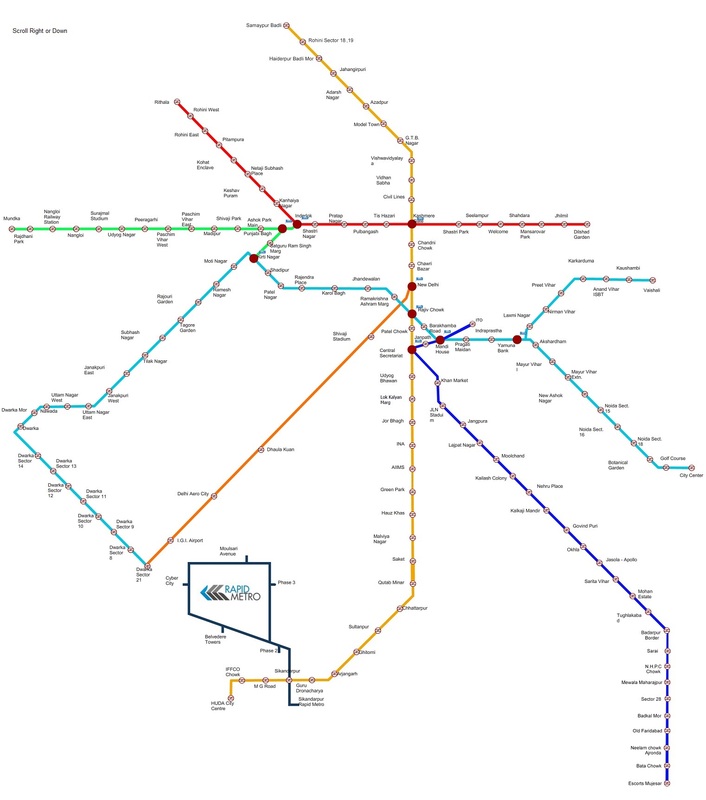 Delhi Metro Route lines are divided into color lines : Red Line, Yellow Line, Blue Line, Green Line and Violet Line. Red Line: Connects Rithala in the west to Dilshad Garden in the east, 25.09 km. Yellow Line: Connects Samaypur Badli with HUDA City Centre in Gurgaon, 49 KMs. Blue Line: Connects Dwarka Sub City in the west with the satellite city of Noida in the east, 47.4 KMs. Green Line: Inderlok (station on the Red Line) and Mundka with a branch line connecting the lines Ashok Park Main station with Kirti Nagar station on the Blue Line. Violet Line: Connects Escorts Mujesar in Faridabad to ITO, 37 km (with 22.8 km being overhead and the rest underground). Airport Express line: New Delhi Railway Station to Dwarka Sector 21, linking the Indira Gandhi International Airport, 22.7 km.